A worthy use of my time? I finally finished my cashmere blanket. It is incredibly soft, cozy, warm and funny looking. The cats love it. I love it…. when I feel it, without looking at it. When I see it, it’s hard not to focus on the crooked lines, and puckered surface. I know that I could have done a better job sewing it, but part of me also knew that no matter how much time I put into cutting perfect squares, piecing them carefully, and finishing things smoothly, eventually it would get dirty, ripped a little, probably one of the cats would throw up on it and it would need to be washed…it is a blanket that is going to get used, everyday, and eventually used up. It is full of imperfection. When I close my eyes, I like the way I feel. When I look at myself, I think “Yikes, you look like a middle-aged, grey-haired grandmother!” Why should this be a yikes? This is right, this is life. I’ve taken it as such a compliment when someone has said that I look younger than my age, but is “looking young” really a worthy use of my time? Isn’t that sort of like packing the perfect blanket away and only taking it out to show others? I want to open up my arms and welcome the supreme gift of being alive in this body, in this moment. I want to use this life to the fullest and not have a well-preserved shell of a person when it is my turn to leave. “Whoever you are, how superb and how divine is your body or any part of it! I believe in the flesh and the appetites. Seeing, hearing, feeling, are miracles, and each part and tag of me is a miracle. Divine am I inside and out, and I make holy whatever I touch or am touched from. Previous postHoly…….Is anyone watching the road?!! I’ve been struggling with my 5-lb. weight gain puddle around my middle this summer. Your message lets me relax into accepting it while continuing my “re- shaping it” routine. Thanks, and much love to you and Jack. 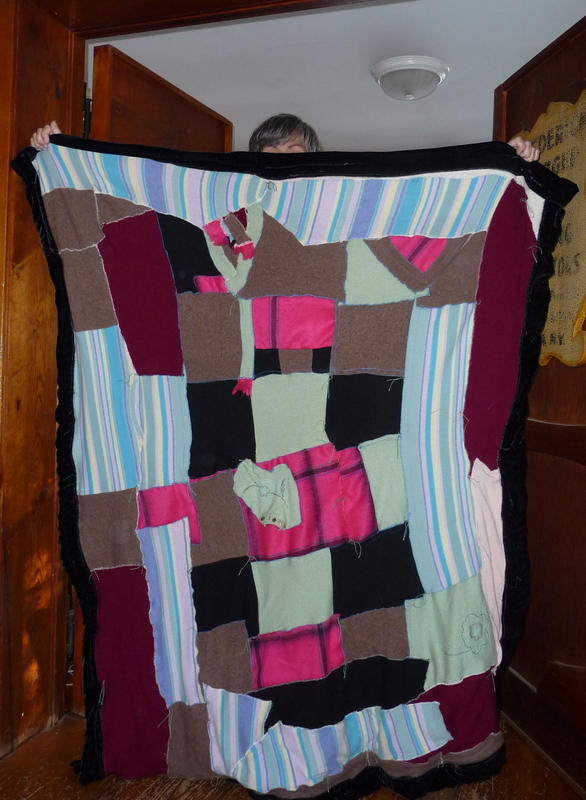 A handmade blanket, just as in the cutting and splitting of wood, warms a person twice over, Mary. Because you poured love into that blanket, it will be felt by those using it. I remember my mother saying, in her late seventies: “when I look into a mirror, I wonder who that old lady is looking back at me”. I’ve long thought that growing older requires a grace that, at first, I didn’t and still don’t have mastered very well. The loss of the waistline, the slipping down of what formerly stayed up, the bags over and under the eyes, sometimes it’s not a pretty sight. I think of a comment my granddaughter made some years ago looking at my wedding picture: “Grandma” she said, “you were pretty”…and I thought of the past tense word she used and smiled. Old age, to me, is what draws a person closer to the spiritual aspect of living. Our bodies are simply the carriers of our inner soul. Beautiful blog, Mary, and beautiful blanket. Thank you for sharing it with us. It’s so wonderful to have a forum to share our “imperfections” with and be affirmed and loved for them instead of in spite of them. We all know what really matters, don’t we. Thank you Sally…I agree with you, we do know what really matters (deep down)…I forget this on a regular basis, but keep coming back to the truth that the more I love and accept myself, the more loving and accepting life becomes…have a wonder-filled weekend with all of your great kitties! As someone very smart said, “Life is short. Eat dessert first.” All I want now, at my age (69) is to love the life I’m in, be open to who I am (along with being grateful to the life-moments that have MADE me who I am), be accepting of who others are within themselves…….and to have a wonderful blanket such as this. The latter probably won’t happen but I can certainly control the former. Thanks for another opening-of-the-eyes today, Mary. We are truly blessed that you share with us. And I am blessed a thousand times over by you! I loved your blog today Mary and also your scrumpious blanket. I was thinking this morning over my cup of coffee that I really want to celebrate turning 70 in a couple of years. I think I’ll start today. Thank you Mary and all the flock with their wise comments. I’ll be gone for a few days, meeting a girlfriend who I have known for close to 50 years. I will refuse to talk about how cute we were back then but talk about how beautiful we are now. Thank you, thank you. Your post made me break out in a huge smile, Myrna! Enjoy your visit with your ‘now-beautiful’ friend. Friendship of that length is a true gift. Thank you Myrna and have a magnificent time with your beautiful friend! Myrna, loved your last comment – “how cute we were back then but how Beautiful! we are now”. Cute fades, but beauty springs forth from the depths of having lived. Just yesterday I read in the feature interview in the Sun magazine, (author Micheal Meade interviewed on his book Fate and Destiny) he offered this quote: “There’s an African proverb: When death finds you, may it find you alive! Alive means living your own life, not the life that your parents wanted, or the life some cultural group or political party wanted, but the life that your own soul wants to live.” He goes on further to say that we were each “seeded at birth” (love that image), that we have a seeded self that begins to germinate at birth. Our true goal in life is to become that self. The encouragement we find here from each other is like sunshine and a rain shower on our collective seeds. What a garden you’ve planted, Mary! Love your blanket! Enjoy many happy snuggles! The first time I ever loved my body was when I became pregnant. I have always appreciated my strength, but not necessarily my “beauty” (translation here : youth). I’m still strong but softer. I want to temper my vanity with a more expansive acceptance of who I have become. I am enjoying my longer white hair and my peaceful heart and my eyes that shine and the strong arms and hands that hold and touch with joy. I am currently working on the third patchwork top for a quilt that I made for my daughter 20 years ago.. She can’t abandon it and I love adding layers to its story. Wrapping up in that kind of love talisman is so sweet. She borrowed it back for a few days last week after a root canal! I love that all of my kids have quilts that I have made. None of them was perfect. Out in our garage somewhere in an old suitcase lie 2 baby blankets – neither was homemade, but they were each of my two sons’ absolute “bubby” – favorite, from infancy well into toddlerhood. You know, the one that swaddled you when you were nursing with Mom, the one that comforted you when teething – they are in tatters, but there is just something about blankets! I love that your kids each have their own quilt Maud. They will always be able to wrap themselves up in your loving embrace! I am not sure I am wise enough to appreciate the essence of arm pits but I am learning that “perfection” is in the eye of the beholder. It is difficult for me to overlook the “flaws” in my quilts or even my old and aging body. But you are helping me to see that the “flaws” show character and are in themselves something to behold and to be appreciated. Thank you once again Mary and those of you that contribute! :‹) And Mary, I love your blanket! Hi Mary…I love your blanket. When I first looked at it, the colorful pattern looked to me like a kimono or cozy bathrobe (complete with a tissue in the pocket!). Some days I am totally comfortable with my imperfections…other days, not so comfortable. But what makes me chuckle, when looking in a dressing room mirror, is “how did MY head get on my mother’s body”? Something an older girlfriend once shared with me and now I KNOW what she meant! Cozy up! You need to go into the blanket making business, Mary!!! I absolutely adore your work and today’s blog. My dear uncle always used to comment, “gives it character” whenever something was just not so perfect; made it so endearing and I have always thought about such things in this way from him. Thank you for another enjoyable morning dose of happy, Mary. Susan L.: When I read Mary’s words today, I went frantically searching the quote you posted by (unknown). I was unsuccessful in my search so I thank you for reading my mind!! Amen for the “what a ride” philosophy. Love, love, love that quote! My feeling is this: I might as well love the body I have right now, because tomorrow it is just going to be WORSE! Thank you and I loved your post about shopping for the jock strap!! Fantastic blog! Your blanket is beautiful. Very wabi-sabi – the Japanese aesthetic centered on appreciation and acceptance of the transient and imperfect. “Nothing lasts, nothing is finished, nothing is perfect.” Kind of like us! I would never have thought of the blanket as “beautiful” but I really appreciate that Jill! I love your quilt, it’s so figuritive a patchwork person. The colors are great! I had a friend once who had a new truck and as soon as he got it home he scratched it with a key so he wouldn’t have to worry about the first scratch. It was a work truck and bound to get messed up. I could have written what you wrote about your body. Thanks for Walt. Mary, your post brought tears to my eyes (and I’m at work, too…ack!). Life is very stressful right now, and every day I feel like I’m not quite young enough or beautiful enough or smart enough by my own internal standard. Gotta change that – I, too, do not want to be that empty shell and I worry that I might be heading in that direction. Thanks for the reminder, and I LOVE your blanket – it’s lovely. OK, Alexis. Repeat after me (and Stuart Smalley): “I’m good enough, I’m smart enough, and dog-gone it, people like me.” I won’t infringe on Mary’s territory (she’s younger and smarter and more beautiful than I! ), but I can say that we all have bad days. Weeks, Months. Um, sometimes years, it seems. And no matter how young you are, or beautiful, or smart, someone’s always going to come along who’s (at least seemingly) younger, more beautiful, smarter. It took me many years to understand that life’s really not a contest. Thank you Alexis..I am so delighted that I posted the picture of the blanket…all of the positive words have made me like it even more…funny how that is…sending you love and good thoughts during this tough time. Thanks for the Walt Whitman quote.I so needed to hear that today.Yes,age brings softness to our bodies but also I think to our souls. I’m trying to learn to celebrate my age related changes, rather than be agast when I see a picture of myself or look in the mirror. After all,I’ve had a good,hard life and I’ve earned every flaw! As a comfortable member of the crone’s club, I thank you for your insightful recognition that CHANGE IS GOOD! And I love the blanket. “to skid in broadside, thoroughly used up, totally worn out and loudly proclaiming … WOW! What a ride”…. Susan L …thanks for this great image….ride ’em baby…. Your blanket came out so lovely, looks so nice and warm.